It took blood, sweat, and tears of many labourers to lay down the tracks for the railways in the 1900s in Lonavala. One thing that kept them going was a snack that we now associate with this town forever. It all began way back in 1888, when India was getting its railway lines. In Lonavala, the construction workers at the tracks felt the need to consume something healthy yet tasty. This was the time when Maganlal Agarwal came up with the idea of Gud Dani. It was a simple preparation of jaggery, peanuts, and ghee - a healthy, tasty, and affordable treat. 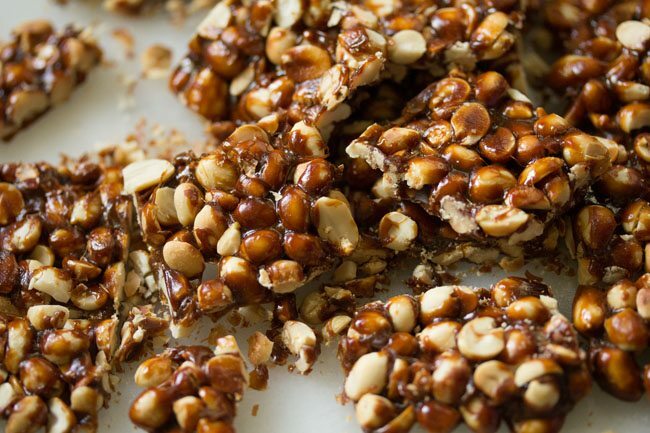 He crushed roasted peanuts, adding sugar and jaggery and blending at a certain temperature. Before it cooled, he cut them into flat pieces. With time, not just among labourers, Gud Dani became famous among travellers as well. In fact, people forgot to board the leaving trains while buying it at the platform! No wonder the railways decided to sell packaged Gud Dani on trains. Exhilarated with this news, Maganlal renamed Gud Dani to what we now call chikki. Today Maganlal is the oldest and the largest chikki maker in India. While the recipe still remains the same, the flavours have expanded to include different nuts and seeds. And like all great foods, this too has its near and distant relatives - be it the kadalai mittai of Tamil Nadu or the peanut brittle of USA.